Orientation – each site has its own particular requirements and seasonal variations. Our buildings have the best orientation to achieve the optimum performance in summer and winter. Thermal Mass – our Thermal Panels and concrete floors provide exceptional thermal mass helping maintain year round constant internal temperatures in the extremes of hot and cold climates. Insulation – high-level insulation in our thermal wall panels and ceilings, as well as surrounding the edge of the floor slab ensures thermal isolation from external extremes of temperature. Glazing – correct glazing is vital for this type of design allowing calculated levels of light and heat for optimum themas comfort. 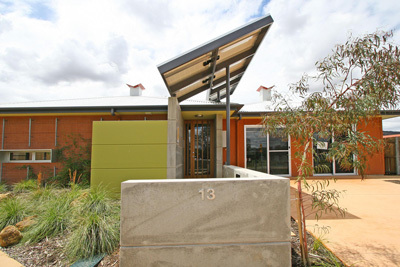 Using these principles, as well as a range of unique building products and technologies developed in-house, we create contemporary and spacious buildings built for the Canberra climate, which offer the ultimate in health, comfort and sustainability. Our green energy buildings deliver a more balanced life for our clients. They often tell us living in a Strine building makes them feel part of the environment around them thanks to the integration of indoor and outdoor living spaces. They feel they are giving something back because they are drawing less energy from the environment, their home/work environment is healthier and they feel they are contributing to a positive future for the planet And of course, they love having either no – or minimal – heating bills in winter as well as absolutely no cooling bills in summer! Thanks to our 30 years experience as a leader in sustainable design and construction, we know how to deliver beautiful living environments that are sustainable. Our clients get the best of both worlds – they do their bit to save the environment while also saving money on energy bills. And at Strine, we are proud to be building a legacy for future generations. Architecture. Strine Environments offers a traditional architectural service as well as partial service depending on the complexity of client requirements, the structure, site, budget and overall size of the project. We do not charge on a percentage basis establishing a written fee proposal based on the tasks and time involved. We offer tender services as well as building services. Design/Build. Strine Construction is the building arm of Strine Environments. We build our own unique Thermal Panels (Link to fact sheet ) and use these to construct our buildings. 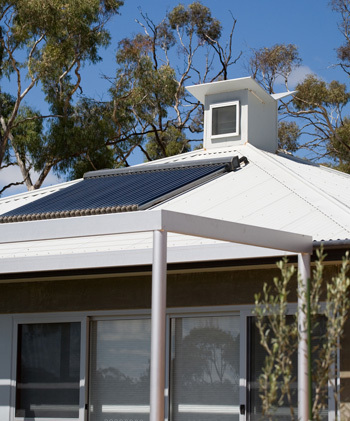 Thermal Panel buildings offer unbeatable thermal mass, almost zero maintenance and using these help avoid the need for cooling and almost any heating. We design and build according to our principles of excellence in design, sustainability and buildability. EcoKit Homes. Our unique modular designs and prefabricated sustainable kit homes. Architect designed and flexible enough to adjust to site and function. They take approximately 13 weeks to build and one week to install onsite, and can be deconstructed if needed. Contact us to find out which service area suits your needs best.